Sourcebook covering a merchant-centered nation in the classic TSR setting of Mystara. 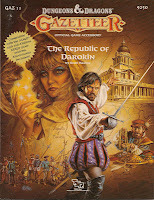 I had a very strange reaction to GAZ11: The Republic of Darokin. I recall skimming it years ago, and thinking it was interesting but a little one-note. Re-reading it, I felt the same way, but I also became increasingly bugged as I went along. 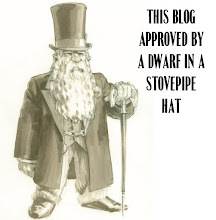 I’ve worked my way through the Gazetteer series- with tales of Halfling Revolutionaries, Radiation-Backed Magicians, and Multi-Stage Elvish Migrations- and yet this is the first time one of these shattered my suspension of disbelief. Robert McKee (among others) talks about the paradoxically strict rules governing a fantasy story. The rules may be made up but they’re adhered to so that the reader can follow the story logic. To extend that further, fantasy and sci-fi introduce "what if" elements and then consider how they play against our experience of the real world. That gets more complicated the more fantastic elements one has to juggle. But we all have some understanding of people, of human nature, of impulses, of society, to compare with those stories. If the transformed world fits with that, it feels right and true. If not, it rings false. And Darokin, despite a lack of magical or fantastic trappings, rings false for me. It is a plutocracy, a country of merchants. That’s interesting (despite that being the base premise for the Minrothad Guilds from earlier in the series). Merchants effectively run the nation, with everyone tied to that activity in some way. And there’s no underclass, because everybody wants to get ahead. And everyone enjoys a high standard of living. And there’s absolute class mobility. And there’s democracy for local representation. And there’s no need for heavy-handed regulation, charity or lawyers because everything regulates itself based on the culture. And merchants only rarely take advantage because doing so would be bad for business in the long run. And despite it being a competitive world of free market capitalism, the driving force of the country is that everyone believes in fair play. The problem that I have is that the society presented here seems so unreal- so apart from my own sense of how people operate. It also doesn’t sync up with my knowledge of history. I don’t want to claim any deep understanding, but I’ve read enough to know that this wouldn’t function in the real world. In the last year I’ve read Splendid Exchange: How Trade Shaped the World by Bernstein, The Ascent of Money by Ferguson and and Basic Economics by Sowell. I took a several courses in economic anthropology for my degree as well. It may very well be that I'm talking out my ***, but the premises and assumptions the setting makes (and not magical or divine ones) seem a stretch. Now I’m a liberal, but one tempered by a political scientist father who stressed the need to understand economic forces and concerns when considering issues. So I have to ask myself- am I coming at this with a bias? Am I like the conservative commentators who condemned the children’s anime film The Secret World of Arriety for promoting an agenda of sharing? I don’t think so. I think the world presented for Darokin has limited dimensions and depth, with some very strange premises and assumptions about human nature and behavior- and the power of ambition to both push and limit people’s behavior. There’s a strange, almost Randian air to the material- but without the subtext of more ‘worthy’ people. If there had been, perhaps, an Immortal introduced who stood for “The Invisible Hand of the Market” I could have bought into the material. That might have answered some questions about how this could sustain itself without exploitation given the economies of trade partners, modest local resources, and limits on communication and information. The lack of significant conflict and contrast within the setting underscores and abets the problem. In most of the Gazetteers, we see conflicts running beneath the surface. There’s a contrast between the stated character or ideals of a place, and the actual nature of it. The tension between those two creates drama and interesting opportunities for the DM. This comes through most clearly in the presentation of “Players’” vs. “DM’s” material. The best offer a clean and unified face to the world, but have an ugliness underneath. We learn that some of those details are lies, some hide battles between powers, and some speak more to ideals than reality. 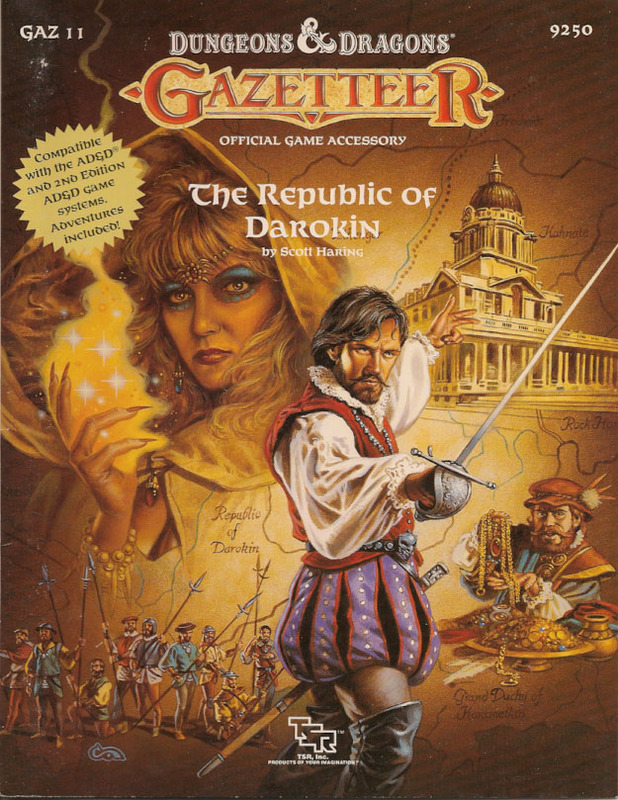 However in The Republic of Darokin, we get a squeaky clean presentation in the DM’s book, and the player’s section covering that simply regurgitates that through first person narratives. In fact the DM’s book seems to stop at many points to emphasize and reinforce that the country is as great as it appears- answering concerns like a spokesman selling a line of goods. As usual the main contents of this supplement split in two: a 32-page player's book and a 64-page DM’s guide. The folio cover has a set of maps on the inside- one a city map of Darokin and the other a map of the central market. The former’s nice and the latter's a little sketchy. There’s also an interior panel with assembly instructions for the cardboard cut-out caravan. This comes on two pages of cardstock and seemed a little primitive at the time and even more so now. The poster map included is disappointingly single-sided. Most of that side is taken up with the map of Darokin (and Alfheim since it lies completely within Darokin’s borders). It also has some images of coins, some less than useful island outlines, and a detail inset of the port of a city (but not the city itself). Clyde Cadlwell supplies a very Italianate renaissance cover image and the excellent Stephen Fabian returns to provide illustrations- some of his best- within the books. Layout and text design remain excellent, but there are more than a few editorial mistakes in this one- including a chuck of material repeated within two pages. Scott Haring and William W. Conners are listed as designers. But Karen S. Boomgarden and William H. Connors are listed for “Development” which isn’t a credit I recall from previous Gazetteers. This is Connors' first entry in the series, though he has extensive Traveller and TSR credits, and would return for GAZ14: Atruaghin Clans. That’s not shocking since this is the first gazetteer to actually mention them in any detail. Karen Boomgarden’s name appears on several TSR products, including several Amazing Engine items and the Mystara-related Hollow World Campaign Set. Scott Haring, on the other hand, I associate more with GURPS products. The Dungeon Master’s Guide covers a wide swath of material. It presents a country effectively run by commerce. While in the past there existed a conventional sense of nobility, that has been replaced by social class (and rights in some cases) based on wealth. The people are focused on wealth, but aren’t conspicuous about its consumption with gross displays seen as gauche. And there’s no bigotry or snobbishness. And everyone has an opportunity. And if someone rises to the top there’s no sense of jealousy. And there’s democracy and low taxes and little corruption. And everyone loves fair play and values it above anything else. And there’s rivers that run with chocolate and a late morning rain of gumdrops. And I’ll try to make that the last snarky thing I say. The Republic of Darokin does present several interesting features. The first half of this booklet covers the basics: history, government, trade and culture. Culturally, Darokin borrows early modern and renaissance Italian and Swiss primarily, with a few other bits thrown in. Darokin is pretty much what it appears to be on the surface- a semi-utopian merchant nation in the midst of other nations far behind in technology and mercantilism. But DM’s will find some richer details to draw on. In particular, the fact that Alfheim lies entirely within the borders of this nation. The continuing struggles with the Orcs of Thar also present a serious issue for the people- especially since military readiness and defense costs money without tangible output. 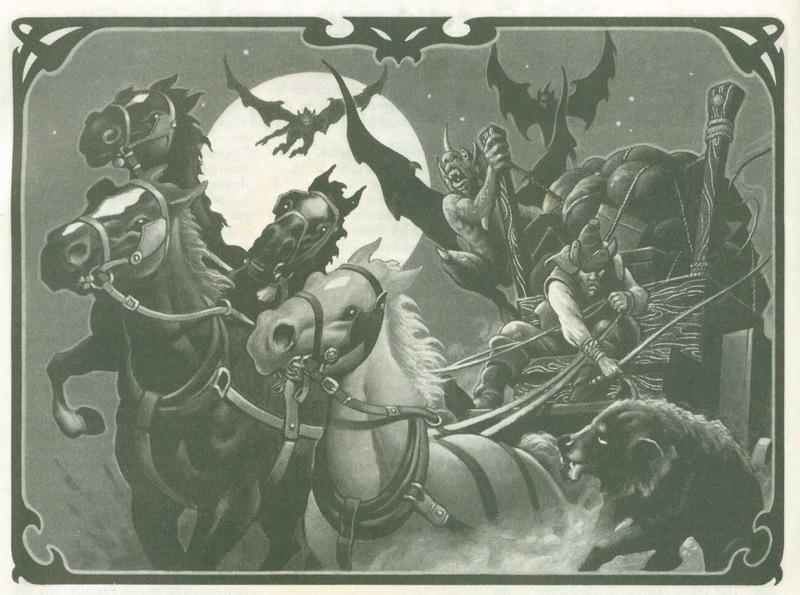 The orcs here appear much more threatening than in their own gazetteer. Beyond merchants, Darokin’s also known for producing professional diplomats and mediators. That’s an interesting concept and a niche not filled in the setting. There’s an extensive section means and methods of trade within Darokin, and the roles the Guilds serve in that. Nine Merchant Houses serve as the narrative backbone of the Darokin setting (as families and clans do in other gazetteer books). These only get a brief overview, which means DM’s will have to do some significant fleshing out to run a campaign here. Darokin’s notable both for racial tolerance, as well as little in the way of organized religion- that’s something of a non-factor in people’s lives. Pages 32-54 cover Cities & Towns and Places of Interest. Most of these entries actually get more detail and discussion than the earlier family notes. The materials given more depth than usually shown in the gazetteer books. In others you might get some of the major cities discussed, plus notes on a few interesting places. This book presents thirty-one cities and towns, including forts and small villages. A small bug for me is the number of these entries which begin with the same letter. That’s a pet peeve; while it might not be realistic a little better spacing of those initial sounds makes it easier for the DM and Players to keep them separate in their mind. Ten places of interest are presented, including the Merchant's Guild Hall (covered in keyed entries over six pages). Some of these are interesting, but all need more hooks for the DM. This section includes a two-page map of the guild hall as well as a one-page map of a fort. Pages 55-58 present seven adventure seeds, broken down by experience levels (Basic, Expert, Companion, and Master). Each seed offers an Introduction, Resolution and Aftermath. These adventures are very lightly detailed and a DM will have to spend significant time fleshing out the bones. Oddly, the beginning of the book suggests that it will present a “complete D&D adventure set in the Republic, and plenty of ideas for an extended campaign set in Darokin.” There’s certainly not a complete adventure here, and the book would have benefited from some discussion of what a Darokin-centered campaign might look like. Most of the previous gazetteers have taken time to do that, so I don’t think that’s asking for too much. Finally, the book ends with eleven NPCs, some with great character portraits. The actual discussion of each characters motives, goals and backgrounds is shorter than in the previous gazetteers, with more space given to stats. The Players’ Guide opens with the ToC for both books (a new design approach for the series) followed by five pages of “What Everyone Knows About Darokin” first person narrative entries. These echo pretty much what’s given in the DM’s Guide. Rules for creating Darokinian PCs follows. This is pretty much restricted to rolling for your family’s social class (and therefore money), picking skills or choosing to be a Merchant (as a secondary class). The book repeats much of the skills system given in previous gazetteers, with a few new and increasingly specific skills offered based on the region. These include Advocacy, Bargemaking, and Lawyer. There are no Darokin-specific skills, although some racial specialty skills are listed for elves, dwarves and halflings. Darokinian characters may also choose the Merchant class, covered in pages 13-20. This is not unlike the Merchant Prince class offered in GAZ9: The Minrothad Guilds, but actually gains experience based on profits earned. Like the MP class the Merchant gains access to a number of trade-specific spells, but a smaller number and of less power. DM’s wanting to use both these classes will want to look closely at them. They seem, at first glance, asymmetrical- using different rules to do fairly similar things. Likewise, DM’s interested in trade as an activity will want to compare the Mercantile Trade systems given here (pages 21-29) with those from the Minrothad Guilds DM’s book. They cover slightly different material, and have slightly different mechanics. The booklet also includes a nice two-page trade map showing where goods sell high and low. There’s also another first person narration and a reprint of the rules for the AD&D game. The cover of the book specifies the AD&D 2nd Edition game, but that’s not noted here. I probably tipped my hand about my reaction to The Republic of Darokin book at the outset. The setting feels weirdly disconnected from reality, in the sense that the society rings false to me. As much as anything, I’m disappointed by the lack of drama and conflict. There are bits and pieces- rivalries between some of the houses and the like, but they are few and far between. That’s disappointing because all of the other Gazetteers, even those I had problems with, offered those kinds of moments and contrasts. 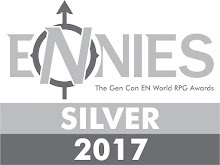 That means that making this region as deep, complex and compelling as the other in the series will require much more effort on the DM’s part. Mystaran DM’s may find this interesting, but GM’s looking for material to adapt would be better advised to look at other Renaissance sourcebooks (The Swashbuckler's Handbook for example). 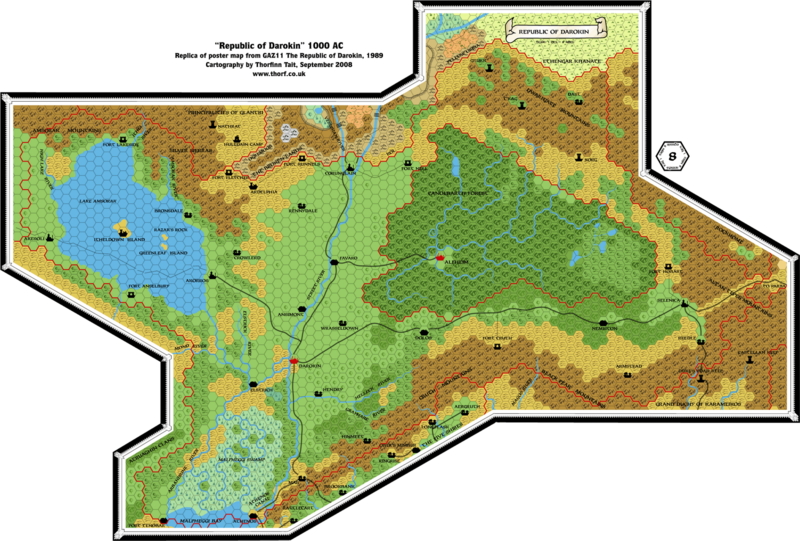 The Republic of Darokin map here is taken from the excellent Mystaran map resource at mystara.thorf.co.uk. to emphasize and reinforce that the country is as great as it appears- answering concerns like a spokesman selling a line of goods. This almost reads like only half a book -- the cheery "official" history that the merchant guilds want to portray. The true story is in the missing half. It sounds like some weird idealized Switzerland meets Steppenwolf with no real form of drive. Drive involves conflict of some sort, but there's none here. I think what makes it so disappointing is that there's a compelling surface narrative- a slick and well presented propaganda piece about the nation. And that leaves me expecting the revelation, the contrast and switch- as happens in all the other gazetteer books. In part the strength of the other books and the expectations they set up make this book even weaker. Sounds about right:P One other hint of conflict (besides the one about Great House rivalries) was the mention in passing of mages not being welcome in Ansimont; it is also mentioned as a "Copper Class" town, suggesting the distinct possibility that the country's stated fondness for mages is limited to the upper classes. The lack of material on religion actually doesn't bother me much. With their immigrant past and trade ties to much of the world, it's not unreasonable to assume that any religion a DM wants to put there can probably be found somewhere.